The AMD ATI Radeon (Mobility) HD 3200 is an onboard (shared Memory) graphics chip (on the RS780M chipset). It is based on the HD 2400 graphics core and features the UVD video engine to decode HD videos (Avivo HD). Hybrid CrossfireX is a new feature of the chipset, that allowes to use the onboard HD 3200 graphics core in conjunction with a dedicated graphics card (of the Mobilty Radeon HD 3400 series) in Crossfire combination to increase the performance (similar to GeForceBoost / HybridSLI of Nvidia). Every frame is rendered by a different graphics core with this technique. PowerXpress is used to save current if the HD 3200 is used with a dedicated graphics card of the HD 3000 series. The driver is able to dynamically switch between the onboard graphics (for low demanding tasks like office) and the dedicated graphics core for demanding tasks (e.g., games). The UVD video engine is able to decode HD videos (MPEG-2, H.264, and VC-1) in all stages and allows the fluent playback of HD videos (e.g. Blu-ray) with a relative low CPU utilization (called Avivo HD). The HD 3200 was the first onboard graphics card that allows the fluent playback of Blu-ray videos. The UVD on the HD 3200 supports the decoding of one video stream only. A second stream (e.g. on Blue Rays with PIP feature) has to be done by the CPU. The graphics core of the HD 3200 stems from the Mobility Radeon HD 2400 and is therefore DirectX 10 capable. Because of the missing graphics memory, the performance of the card is a bit lower than of the HD 2400. Theroretically, dedicated memory chips can be directly added to the chip, making it a dedicated graphics card. Because of pricing it is unclear if any manufacturer will add memory to the chip. Still older games like Doom 3 or Quake 4 should be barly playable. Compared to older onboad graphic chips (e.g., GMA X3100), the HD 3200 is much faster. Even the Centrino 2 graphics core (GMA 4500M HD) is noticeable slower than the HD 3200. Using Windows XP, the HD 3200 seems to have problems with current and older drivers, as there is no 2D accelleration. This leads to very slow interactions with windows and scrolling (especially with Firefox as reported in various discussion boards). More information on the topic can be found at Planet 3D Now (de) or the AMD forum. The AMD ATI Mobility Radeon HD 3400 IGP (or just Radeon HD 3400) is most probably a chipset graphics card for laptops. 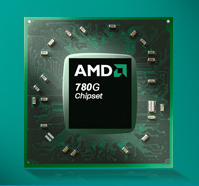 It is used in the Lenovo Edge laptops with AMD processor and should be slower than the HD 4225 IGP. Therefore, it can be based on the HD 3200 or HD 4225 chipset with different clock speeds. See both pages for more information on the graphics card and benchmarks.